WOW! February was a GREAT month! It began with our church mission trip. Guatemala was AWESOME! We built a house, visited orphanages, visited a feeding station, saw the black sands & the Pacific, provided haircuts & fashion, visited the school, blessed by an inspiring service with 4 pastors speaking, created and continued many relationships with our Guatemalan family, visited Antigua and MORE. All done to give Honor, Glory, and Praise to our Savior. We witnessed His presence, counted our blessings, learned to walk closer in His steps and built a community of believers! Our mission now begins, bringing it home, sharing our love and serving our Lord. What a privilege it was to lead this team! Guatemala was a HUGE SUCCESS! We will have a church presentation on March 10th. Speaking of March 10th, we will have a “Mexican Night” (tacos, enchiladas, beans, etc) @ 4:45 PM to benefit and begin the fundraising for State Youth Convention. Cost will be by donation. This will happen just before Pastor David’s series on ‘3:16’ and the weekly youth meeting at 6:00 PM. All youth who are entertaining the idea of SYC should come & help in earning their registration fees due at the end of the month. All parents, church members & guests are invited to kick off our Spring adventure. We are hoping to have Guatemalan pictures available during the supper. We are declaring March 17 as “Pop Can & Bottle Sunday” to help our registration drive. We also hope to have a ‘can & bottle’ collection day in town perhaps the day before the Sunday. Other upcoming fundraisers will be yard work, scripts, garage sale, Mother’s Day flower sale and hopefully another new idea coming down the pike. State Youth Convention is coming quickly! Although it isn’t until the weekend of May 17-19, early-bird registration is $40 and must be mailed into the state office by March 30th. SO, we will be making our list & collecting money the week of Sunday, March 24 – 29th. The balance will be $80 due by the convention. 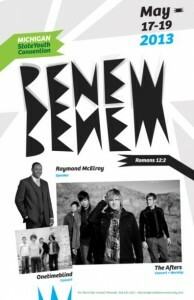 This year’s theme is “RENEW” and will feature the concert & worship band, The Afters, with Chicago Bear Chaplain, Ray McElroy as the speaker and a special drama presentation in concert by onetimeblind. It’s one of our greatest weekends of the year. Our February 22nd LOCK-IN was another reason February was a great month. We had almost 30 students plus adults in attendance for a night of silly games, food, movies and more. It’s great when we open up our church and invite our friends to have fun and witness the love and word of God. Since the last newsletter we also had a “Bowling” night at Northern Lanes with pizza, games and movies at Pastor Jerry’s house afterwards. It’s fun doing things together with Christ as our common denominator! Our series, “Doing the Disciplines” ended last week. During our series we learned about Bible Study, Prayer, Quiet Times & Devotion, Serving, the Importance of Church and Reaching Out – all topics to strengthen our walk with Christ. We begin in March a series on the “Fruits of the Spirit” which will take us through May. A new Snack Donation Sign-Up is up on the bulletin board as well as the “Student of the Month” feature and upcoming activities. Youth will continue to be @ 6:00 PM on Sundays for 7th-12th graders and on Tuesdays for 6th graders @ 2:30 PM. We would also like to extend an invitation to Easter Week activities at the church. Maundy Thursday services will be March 28th. There will be an area Good Friday service @ Faith Wesleyan on Meridian Road. Easter will be the morning of March 30 with an Early Morning service at 9:00 AM followed by refreshments and activities for children. Easter Sunday service will begin at 11:00 AM. There will be not church or youth that evening. Everyone is welcomed! Parents, your prayers, support and encouragement are greatly appreciated and we look forward every week to sharing the Gospel of Jesus Christ with our students through interaction, study, fellowship and relationship. Thank you for sharing your son or daughter. We thank the congregation for your help with snacks, with your encouragement and mostly your prayers.